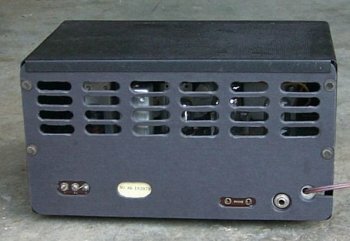 To keep the receiver price low, all S-38s were transformerless designs. This type of design works well, but presents dangerous shock hazards. 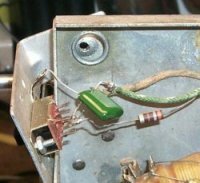 The safest way to operate an S-38 is to use an isolation transformer in the AC supply to the radio. 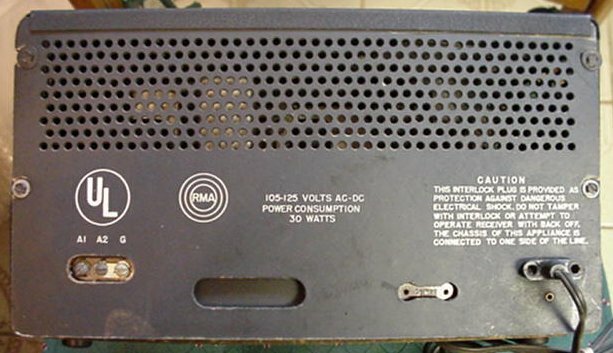 The set can be operated safely without an isolation transformer, but ONLY if the original back cover, bottom cover and rubber chassis isolators are in good condition. I'll cover the safety items in more detail in the restoration below. 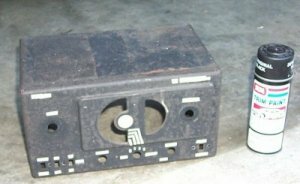 My second antique radio was an S-38 that I purchased and repaired in 1975. I enjoyed the radio immensely and listened to many shortwave broadcasts on this set. A few years later, I gave the set to a good friend. For a number of years, I have considered buying another S-38. I finally purchased one again on March 23, 2001. Here is my S-38 as I found it at the Southeastern Antique Wireless Association meet. 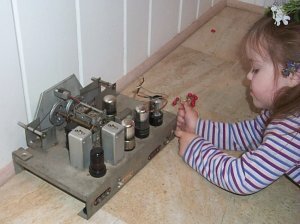 It's dirty, and some of the original knobs are missing or broken (along with the cardboard back), but it's restorable without too much effort. A picture of the chassis - minor corrosion, but complete. 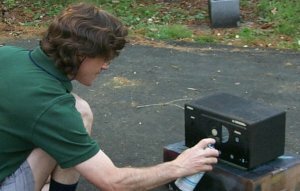 I prefer to leave an original finish on a radio whenever possible, so I cleaned the cabinet in hopes of making the original wrinkle finish paint look good. The cleaning removed a lot of dirt, but it still did not look too great. I decided to very lightly overspray the black wrinkle paint to restore the original color. I did not want to re-letter the front panel, so I taped over the markings. Spraying the paint. As you can see, I'm using my custom random draft paint booth. I used naval jelly to remove the corrosion on the chassis. I don't like using these chemicals on radios, but I have not found a better method to completely remove rust. A damp sponge removed most of the naval jelly residue. I removed the remainder of the corrosive chemicals with carburetor cleaner. The carb cleaner flushed the naval jelly out of the crevices and off of the underside of the chassis. When the chassis was dry, I applied a coat of satin lacquer to prevent corrosion. Here is the rubber isolator that keeps line voltage off the cabinet. There are four isolators, one on each corner. 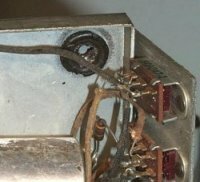 These MUST be replaced properly if the radio is going to be operated without an isolation transformer. The rear isolators are easy to replace - just pull the old one out and install a new grommet of the same size. The front isolators are riveted in. I had to drill out the old rivet and use care not to loose the little metal piece that fits into the isolator. 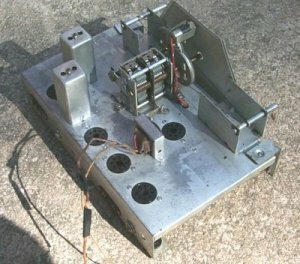 The chassis and switch assembly with the rubber isolator removed. I re-installed the isolator and switch brackets using a small nut, bolt and washer. A drop of locktite keeps the assembly secure. 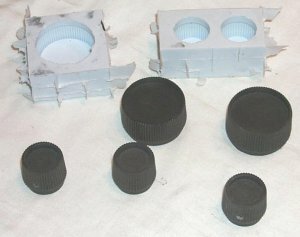 My first attempt at making replacement knobs. I used latex molding compound (purchased at a local craft store) and polyester resin (purchased at autozone). These knobs were only fair. These knobs will not pass a close inspection. I began to search the internet for pages on molding and casting. 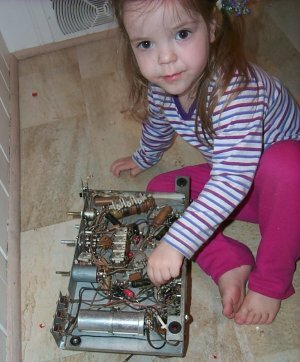 I'm fixing the radio Dad! 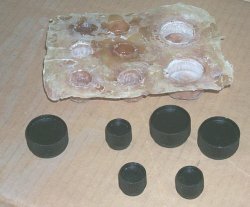 New knobs and molds made with RTV and cast in polyurethane. These knobs really look like the originals! "Aging" the new bottom label with a used tea bag. . I installed the new label on the cardboard bottom. Look closely and you will see the stains. I created the label in a word processor. I scanned in the "h" from the front of the S-38 and edited it to create the proper logo for the label. The label looks almost the same as the original. I have not yet found a font that exactly duplicates the hallicrafters font. Pictured is the pattern for the back printed in legal paper. I was able to make the pattern due the the generosity of W4AWM who provided scans of the back and bottom. The cardboard is the type used for automotive upholstery backing. I made two punches for the two oblong holes. The punches are made from electrical conduit and pipe caps. The standard punches are for the mounting holes and the line cord hole. I glued the paper patter to the cardboard with rubber cement. 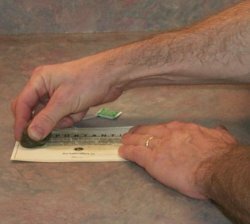 After punching, the paper peels right off. I did a bit of research and determined that this pattern will work for the S-38 and S-38A. EVERY version of the S-38 has a slightly different back! The reproduction cardboard back - finally finished! My custom made punches distorted the cardboard too much, so I made another back using a standard round punches and a straight chisel. Once the holes were punched, I cleaned up all the edges with a dremel tool. The back is not absolutely perfect, but it's reasonably good and fits very well. I punched an extra hole for the phone jack someone installed on the rear of the chassis. 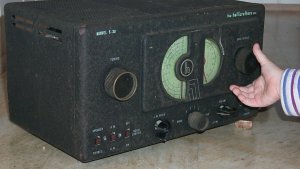 Favorite Tube-Type Shortwave Receivers - Hallicrafters S-38 and S-40 Dxing.com web page with a picture and specs. Hallicrafters Model S-38 Part of Phil Nelson's outstanding site. Includes a brief S-38 history and his restoration of an S-38. 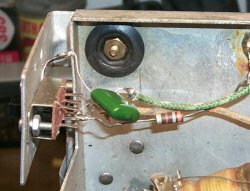 Adding an S-meter to an S-38 A great page with enough detail to do the job right! Also on Phil Nelson's site. 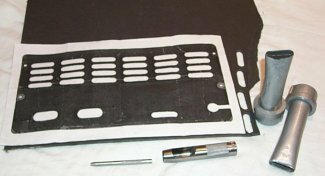 The Boat Anchor Manual Archive -Hallicrafters page Free service information and owners manuals includes S-38 to S38E. Echophone Commercial EC-1 A/B A page on the predecessor to the S-38 - Japanese page with interesting info. Skywaves S-38 picture and Description You have to page down a ways to get to the S-38. 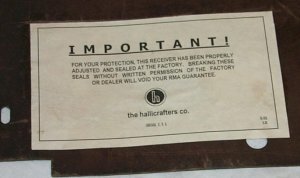 Interested in Hallicrafters equipment? Be sure to check out the Hallicrafters web site. All content copyright Stan Watkins 2001 unless otherwise noted.